"For readers weary of literary fiction that dutifully obeys the laws of nature, here's a story that stirs the Brothers Grimm and Salvador Dali with its claws . . . as gorgeous as it is devastating." This novel, from one of our most exciting young writers, is a powerful exploration of the limits of parenthood and marriage--and of what happens when a marriage's success is measured solely by the children it produces, or else the sorrow that marks their absence. "Somber, incantatory sentences to hold you within [Bell's] dreamlike creation.... This unique book leaves you with the haunting lesson that even if you renounce and cast away your loved ones, you can never disown the memory of your deeds." "Will haunt you long after you’ve read it, Bell’s novel mixes myth with a spooky, unsettling tone best described as “Midwestern Borges”.... something few writers, debut or otherwise, could so perfectly render." "Bell puts the fable in fabulism.... This spare, devastating novel... is as beautiful as it is ruinous. A tragedy of fantastic proportions, the book’s musical, often idiosyncratic prose will carry its readers into an unfamiliar but unforgettable world." "Matt Bell’s visionary debut novel In the House Upon the Dirt Between the Lake and Woods is one of the most singularly strange and beautiful and wondrous books to come along in a long time.... [Bell] has invented an entirely new rhetoric of fiction and marked unique territory of his own." 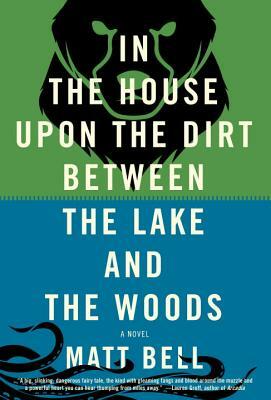 "In the House upon the Dirt between the Lake and the Woods has an impressive wealth to share with its reader... it’s a gorgeous, bottomless book." "One of the year’s best novels ... Bell keeps the narrative evolving, shifting groundrules and revealing more about his setting and characters. Disorienting and evocative, this is a fantastic reading experience." "Meticulously designed, with a particular focus on the musicality of its sentences.... an unflinching portrait of the struggle to keep a family intact." "Bell cracks us in the mind's eye, drops us in inky waters, leaves us dripping with love potions and scarred from our innermost animal natures…. In the tradition of Calvino, Borges, and Kafka, this is a mystic's tale—the gods here are most definitely crazy." "Gorgeous, brilliant, often darkly hilarious and always moving.... Written with an ingenuity and joy that call to mind Italo Calvino's Invisible Cities." "Bell brings us everything: symbolism, futurism à la David Ohle, devastation, surrealism, scenic energy, fractured fairytales, consumption, struggle, claustrophobia, and family decay... [But] Bell knows how to keep his world in check, his every word balanced against another, delicately, like a system of weights."